In 2014, I gave a public commitment in a speech to move International Workplace – the company I'd founded some 20 years earlier – fully into the digital age. I believe there is, and will always be, a place for face-to-face delivery of training, where human interaction adds a dimension that can't be replaced. But I also believe that a large amount of what currently passes for training (much of which is knowledge sharing or self-learning) *can* be delivered digitally, more time-efficiently, more cost-effectively, and with better results. Over the last few years, in order to transition fully to the digital economy, we set about developing our digital learning systems to create the best possible solution for our clients. We have built a clever platform that allows us to seamlessly integrate with - rather than replace - client systems. But which can operate autonomously for those who are yet to have an LMS of their own. Our work has been shortlisted at the Learning Technologies Awards in 2017 and 2018, and was recognised as a finalist at the Learning Awards 2019. Where it comes to health and safety training, we are in fact the *only* approved training provider who can deliver IOSH-approved courses through a client's LMS, while still controlling all of the online administration, assessment and project marking processes that IOSH requires of us. Because we are an IOSH-licensed centre, the client doesn't need to be. Just like in a classroom, with our online IOSH portfolio we run the course in the client's environment, taking care of all the delivery. The savings for businesses are huge: typically up to 43% against the classroom version, in the case of IOSH Managing Safely. We still run the classroom version - some people prefer new supervisors and managers to learn that way. But the take-up for the digital version has been huge, and the benefits are tremendous. Access to analytics and insight are now regarded by our clients as being just as important as content is to learners. 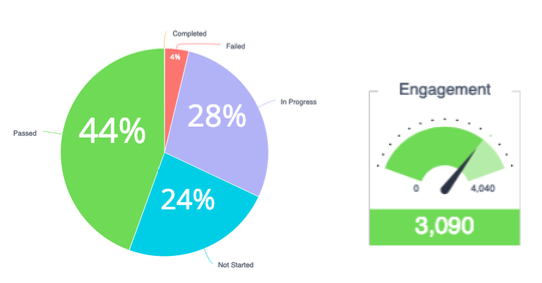 There's no point having great courses if a manager can't report on key metrics in real time. Increasingly, clients are looking for more useful KPIs such as engagement by learners: either in isolation, by department, or to benchmark themselves against average levels for all of our clients. They're also looking for tools: in the case below, the ability to click on a segment of a pie chart and instantly take action, for example by sending a specific message to the people in the segment (usually a 'hurry up' message to ones in progress). Despite this progress, there is still resistance to change. This might be because there is so much going on in the learning and development market, not least where learning technologies are concerned. The factors at play are all typical of an immature market: a relative lack of market knowledge among buyers, made worse by the confusing claims made by suppliers, all of whom want their solution (with all its bells and whistles) to be adopted as the standard go-to solution. So I understand the confusion, though I hope we're not contributing to it. There will always be a need for IOSH courses delivered in the classroom or onsite (and we will continue to deliver them). But the future of IOSH-approved certificate level courses is digital. SCORM-based courses are old hat. If you haven't moved to xAPI (Tin Can) then you're missing a trick in terms of granularity of data, analytics and insight. Our portfolio of IOSH courses (Working Safely, Managing Safely, Managing Safely Refresher, and Safety for Executives and Directors) are all built in xAPI. If you have an LMS, that's great. You can run International Workplace's IOSH-approved courses through your LMS, just like any other course. Your learners won't know any different. And your managers will be able to access learner records through the normal reporting interface. If you don't have an LMS, you can run IOSH courses through International Workplace's own learning platform (known as ESP), which can be branded to look like your own. This will give you access to the same level of data, analytics and insight that you'd get from any other LMS - but it comes at no extra cost. As well as saving up to 43% against traditional classroom courses, running IOSH certificate courses digitally lets you get access to groups and individuals who are often difficult to reach: shift workers, lone workers, remote locations. And for many learners, they actually prefer to learn this way! Information security is a key issue. Our services are GDPR conformant, and we have attained the ISO 27001 standard for information security management. There's a whole host of administration, workflow and quality standards that International Workplace - as an IOSH-licensed centre - needs to abide by. I'm pleased to say we've been doing this for nearly 20 years. You can rely on us so that you don't have to.